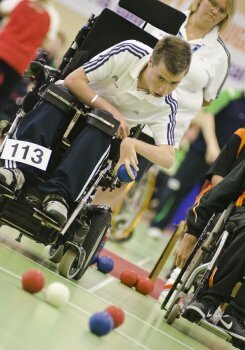 As the 2011 Boccia World Cup enter the final day of competition at the University of Ulster’s Jordanstown campus, GB player David Smith is hoping he will be the one picking up the gold medal. David, who has already picked up a team medal this week, is now hoping to add individual glory to his trophy cabinet. He faces a tough test against Brazil’s Guilherme Moraes in the next round and remains confident. “We have already won a team bronze this week. It was a little disappointing we didn’t win the gold,” said David. “Individually it’s all good. I have won all my games so I’m through to the next round. A BC1 category player, David also picked up a gold medal in the 2008 Beijing Olympics as part of the team competition alongside Nigel Murray, Dan Bentley and Zoe Robinson, and has his mind firmly set on having the gold around his neck at the University of Ulster on Friday. “I’m very positive. We come here to win medals, that’s my job and that’s what I intend to do,” he said. The showpiece finals day on Friday 26 August will see the quarter-finals, semi-finals and finals take place in the four Boccia categories – BC1. BC2, BC3 and BC4.